An epic sojourn might be defined as one during which babies are conceived and born along the way. By that definition my hike has now become an epic journey - an odyssey. The day was pretty epic too - a Sunday with perfect weather and a section of easy trail with great visual rewards brought out the crowds - families with small children, slow moving elderly retired couples with their walking sticks. 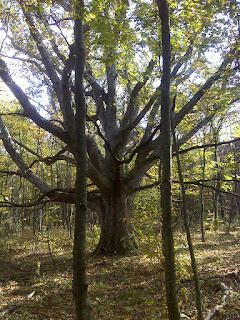 It was a great day, and a great place, for the masses to partake of a bit of this epic trail. Some days I write this blog first, other days I write my personal journal first. Today I did the latter. So to save time, I'm copying and pasting the personal journal account to lend the story of today's hike the greater depth it deserves. Got up about 6:15 and did all hike preparations then drove the 0.3 miles to the Humpback visitor center and used their rest room, then drove the 5.7 miles to Rockfish Gap where I parked at the parking area full of old closed businesses. If that is private property it seems that parking for day hikers, runners, and bikers, etc. is allowed because there are always plenty of them there. I hit the trail northbound into Shenandoah National Park at 7:20AM and did the four mile section to the McCormick Gap, the first crossing of Skyline Drive. I can only describe this section of trail as trashy. It’s on a narrow corridor of land nobody wanted between private land on the ridge to the east and Skyline Drive to the west. It meanders over rocky footing and through scrubby looking forest. There are pretty sections, and places where the big rocks are impressive, but it’s obvious that this section of trail is one of those where the AT is just trying to find a way to get through (in this case to get between Rockfish Gap and the true beginning of Shenandoah Park lands at Jarman Gap. On the way up I met two women headed south who said they’d seen me starting out (doing the road walk at Rockfish Gap as they drove by to park at Beagle Gap). On my way back I found a dropped pair of sunglasses and then reached the two women resting on some rocks – the glasses belonged to one. The other was ‘Three Day’ who has been hiking the AT via long weekend day hikes (three day chunks) for 7 years, since she turned 50. Her friend was a relative – seems she usually recruits someone she knows as support, and in this case to hike along. Three Day has done about 1000 miles of trail from 20 miles into NH down to this area. 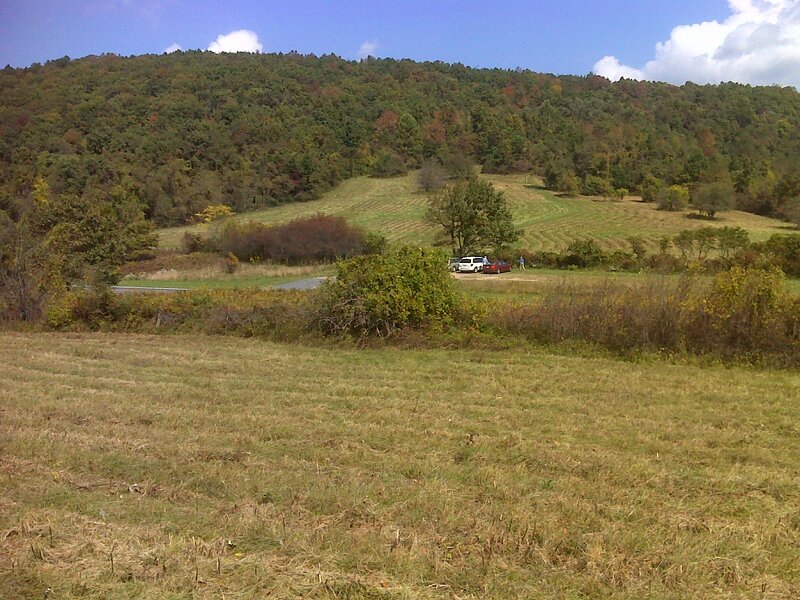 I got back to Rockfish Gap at 11:30 and then drove into the park, using my senior pass to get in free, and parked at the big lot at Beagle Gap, very popular for day hikers and set in a very pretty open meadow. I hiked south two miles back to McCormick Gap, again on land that the AT just seems to need to borrow to find a way through. In this case it takes a route past communication towers, sometimes on their access roads, over the long summit of Bear Den Mountain. 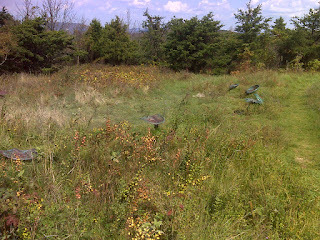 The meadow walking is pretty, and the summit areas, though scrubby, have an open feel that is pleasant. 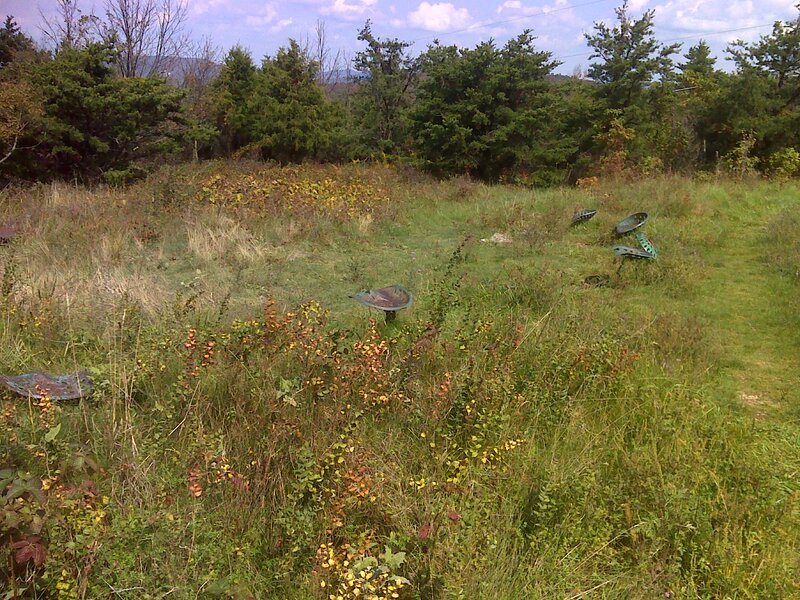 Below the northern cluster of towers there is a semi-circle of old metal tractor seats planted in the ground beside the trail, where hikers can have a convocation. These seats have been in place for a long time, and a couple of them are broken now, but it's still one of the unique AT venues that you don't quickly forget. On the summit ridge I got out my cell phone and called both of my kids to start making arrangements for coming home to celebrate my son’s birthday in a week. He wanted me to get back to him about the details, but Sunday was okay with him. 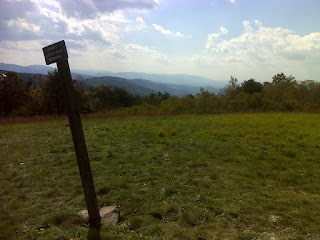 I made the round trip to McCormick Gap and back then reloaded some supplies and headed north to Calf Mountain Shelter. This side of the meadow has a bunch of old apple trees near the edge of the forest, and they were full of red ripe apples, though I didn’t indulge. 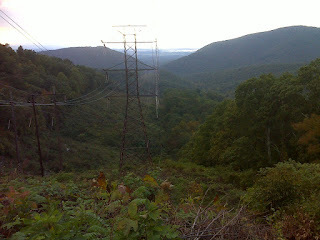 I had last hiked here almost exactly two years ago (Sept. 17, 2010), and had sampled the apples then. On the saddle between Little Calf and Calf Mountain the AT returns to its old route and makes the useless climb up to the now totally wooded summit of Calf Mountain. 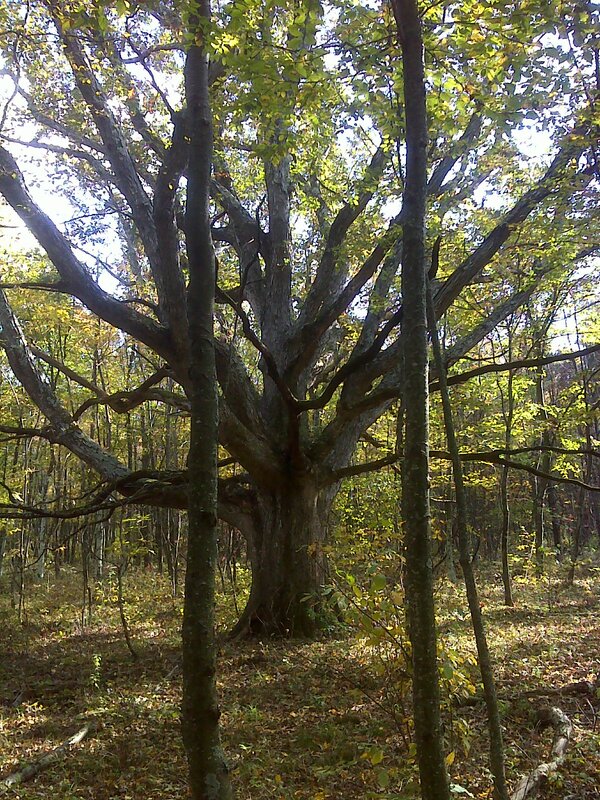 The young age of all the trees (except for two old monarchs - wide spreading white oaks) makes it clear that this was once a huge open summit area – too bad it was allowed to become overgrown, just as with many of the balds down in North Carolina. These open summit areas are rare and special, and the ones that are still maintained as open land are some of my favorite places along the AT, so it was a true delight to have Little Calf Mountain added to that list, but while they were doing the reroute they should have had the trail skip the pointless climb of Calf Mountain and head gradually down to the shelter instead. The shelter is on a 0.3 mile side trail. I turned around there and headed back as the afternoon was heading toward evening. I passed many day hikers, including families with young kids and slow-moving retired people on this section of trail – clearly a well-known area for short easy hikes. Finally I made the short drive up to Jarman Gap and then the short (one mile) hike from there south to the Calf Mountain Shelter and back. Jarman Gap is where Shenandoah Park really begins. South of there, Skyline Drive runs through a very narrow corridor of park-owned land (and the AT is outside of that corridor). North of there (actually north of the power line that crosses the ridge a quarter mile south of Jarman Gap), the park-owned land becomes very wide and extensive and continues that way all the way up to the doorstep of Front Royal. I was finished with my hiking at 6:15PM. Because of all the moves from one parking area to the next, and because of side trails taken (also probably because the new reroute has not yet been added to the official trail length), I only accomplished 16 miles of official AT in those 11 hours. My GPS tells me I hiked almost 19 miles. Here's the map of today's trail hiking with straight lines connecting the various places I parked to access the trail. The title line is a link to a whole bunch of photos taken along the way.